For many content publishers, managing video can be a tricky business, particularly when you’ve got clips spread across multiple services like YouTube and Blip.tv. Today video bookmarking startup VodPod is launching a new product called VodSpot that’s looking to help, by allowing publishers to create dynamically updated video portals that can aggregate your site’s video content, as well as pull in new content that you’ve bookmarked around the web. 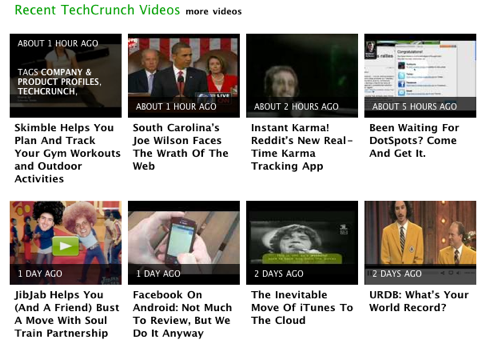 We’ll be using the service to power our new TechCrunch Video site, which you can find at http://video.beta.techcrunch.com or in the masthead above. The new site will feature a collection of recent video content from throughout the TechCrunch network, and we’re also opening it up to user submitted videos — if you have an interesting interview, demo, or other tech related video that you’d like to share with the TechCrunch community, here’s your chance. We last covered VodPod back in 2006, when the site launched as a YouTube competitor with some social bookmarking features. Since then the site has seen some major changes: CEO Mark Hall says that within a month or two after launching, VodPod decided to disable user-uploaded videos and to concentrate on its bookmarking functionality, which was quickly becoming the site’s most popular feature. The startup launched a widget that allows bloggers to include their most recently bookmarked videos into their sites, which Hall says is currently being used by over 40,000 bloggers. In 2007, VodPod launched an API that allowed sites to manage their video content, drawing from videos that they’d either bookmarked on VodPod or uploaded themselves. The API has been used by Second Life, NewTeeVee and a number of other well known sites. But up until earlier this year, using the API required developer resources, which prevented many sites that would have otherwise benefited from having their own video portals from using it. Around nine months ago VodPod launched an experimental version of VodSpot as a hosted solution that allowed publishers to build video portals with a minimal amount of work required (Hall compares this to WordPress.com’s hosted blogs versus WordPress.org). But at the time the customization options were limited, with only a handful of designs available. Today’s launch includes support for VodPod’s new template engine Laminate, which will allow publishers to fully customize the appearance of their sites. Hall says that the company will monetize VodSpot by offering some premium features like custom domain mapping and control over advertising, which will cost $10 a month. He says that sites that draw lots of traffic will likely fall under a different pricing structure, given that VodSpot will be hosting the content. He also notes that VodPod is driving some impressive traffic now — it has quintupled since a year ago and now sees over 10 million monthly uniques — so the revenue coming in from advertising is significant. In conjunction with today’s launch, VodSpot is also open-sourcing the Laminate template engine, and is launching a new version of its API that adds support for finding the most popular videos in a given subject (say, politics) across the thousands of video sites that VodSpot indexes.